← Tee Time: Jesus. That is my final answer. What I don’t remember ever being taught about, though, was lynching—at least not in very much detail. I didn’t learn about it in school, and I certainly didn’t learn about it in church. I was aware that in the Jim Crow South, white mobs sometimes brutalized black men and even killed them by hanging, but that was about the extent of my knowledge of lynching. I didn’t know how common and widespread it was. Nor that women and children were among the victims. Nor that burning and mutilation were almost always involved. Nor that lynchings were considered community-wide entertainments, replete with food vendors, souvenir salesmen, and free passes from school. James H. Cone’s book The Cross and the Lynching Tree (Orbis, 2013) is both history lesson and sermon—a harrowing look at America’s national crime (as Ida B. Wells called it) and the ways it was (and was not) confronted as well as a brotherly rebuke of the white church’s silence on the issue and a proposal for how to move forward. The cross and the lynching tree are separated by nearly two thousand years. One is the universal symbol of the Christian faith; the other is the quintessential symbol of black oppression in America. Though both are symbols of death, one represents a message of hope and salvation, while the other signifies the negation of that message by white supremacy. Despite the obvious similarities between Jesus’ death on the cross and the death of thousands of black men and women strung up to die on a lamppost or tree, relatively few people, apart from the black poets, novelists, and other reality-seeing artists, have explored the symbolic connections. Yet, I believe this is the challenge we must face. What is at stake is the credibility and the promise of the Christian gospel and the hope that we may heal the wounds of racial violence that continue to divide our churches and our society. . . . Illustration by Charles Cullen. Frontispiece to Countee Cullen’s The Black Christ and Other Poems, 1929. The Cross and the Lynching Tree integrates four different modes of writing—historical analysis, polemic, literary and visual art exegesis, and theological treatise—woven together into one vibrant, seamless cloth. I will examine each of these below. Cone, a black professor of theology, grew up in segregated Arkansas during the 1940s and ’50s. Though he doesn’t mention having ever witnessed a lynching, he shares how as a boy he was gripped by a constant fear that his dad might not come home from work that day. The term “lynch” means to put to death by mob action without legal sanction. The term is thought to derive from the name Charles Lynch, a Virginia planter and politician who took it upon himself to punish—extralegally—supporters of the British crown during the American Revolution. As America expanded westward away from the courts, lynching was regarded as the only way a community could protect itself from “bad people” and was carried out against accused rustlers, robbers, and wife abusers. After the Civil War, however, the term came to refer primarily to mob violence and torture directed against blacks. Such race-targeted lynchings were incredibly rare before the Civil War, because killing black slaves would have only resulted in a loss of property and profit. But after the South lost the war and had to give up its slaves, lynching fever gripped the region, as Southerners weren’t ready to grant full human status to African Americans. Though scholars give or take a decade on each side, Cone defines the lynching era as extending from 1880 to 1940. During these sixty years, more than five thousand African Americans—men, women, and children—were killed in the US by white vigilante mobs, almost always on trumped-up charges. And not just in the South (though that’s where they were most prevalent): lynchings were recorded in every state in the continental US with the exception of Massachusetts, Rhode Island, New Hampshire, and Vermont. Lynchings began to decline in the twentieth century, but 1940 is not a definitive cap: the 1955 lynching of fourteen-year-old Emmett Till, prompted by his alleged flirtation with a white woman, is said to have jump-started the civil rights movement. For a photojournalistic account of America’s “lynching industry,” see James Allen’s Without Sanctuary, an exhibition turned book and website. Viewer discretion is advised. Lynching isn’t just part of secular American history; it’s church history too, Cone points out, because it was overwhelmingly Christians who carried them out and attended them. As they lifted tortured black bodies up onto trees to meet their death, Christians—who worship a crucified Savior—failed to see the irony of their actions. Page from a 1930 issue of Bezbozhnik (“The Godless”), a monthly satirical magazine published in the Soviet Union between 1922 and 1941 by the League of Militant Atheists. With handwritten translations. The Cross and the Lynching Tree exposes the hypocrisy and willful blindness of most white American Christians, with an aim toward reconciliation. Now, I’ve read works of black liberation theology before and was thoroughly put off by some of them because of their angry, bitter tone and what I perceived to be reverse racism—that is, an attitude of black supremacy and hatred toward whites. There was a lack of desire to forgive and to allow for healing. However, in this book Cone approaches white readers with a loving attitude of reconciliation. Although an underlying (and justified) anger certainly exists, it does not distance; it engages. The only exception—and this is my only criticism of the book—is that I think Cone went overboard on the lambasting in chapter 2, which is an extended rebuke of the famous American theologian and ethicist Reinhold Niebuhr for his failure to make lynching a prominent focus, or even a part, of his theology, and to engage in meaningful dialogue with African Americans. The answer, Cone says, isn’t to forgive and forget, but to forgive and remember. That’s the only way we can give voice to the victims, to “the crucified peoples of history” (Ignacio Ellacuría). The link between the crucifixion of Christ and the lynching of blacks has been most clearly articulated by black artists—poets, short story writers, painters, printmakers, musicians—who through their art proclaimed their humanity and resisted the evils of lynching. This is the focus of chapter 4 and for me the highlight of the book. I was most arrested by the imagery from the blues song “Strange Fruit,” famously performed by Billie Holiday but written by a white Jewish schoolteacher from New York City, Abel Meeropol, who was horrified by a photo he saw of a double lynching. It’s considered one of the most influential protest songs ever written. Below is a video recording of Billie Holiday’s historic 1939 performance, but I also encourage you to listen to Nina Simone’s 1965 rendition. It’s a chilling song. Literally chilling. It implicitly challenges Christians to consider how they can possibly reconcile the “strange fruit” they hung on southern trees with the “strange fruit” Romans hung on the cross at Golgotha. He also covers some of the protest art that came out of the two anti-lynching exhibitions of 1935—one sponsored by the NAACP, the other by the Communist Party. He describes four works in particular that liken the black struggle to Christ’s on his way to Golgotha. 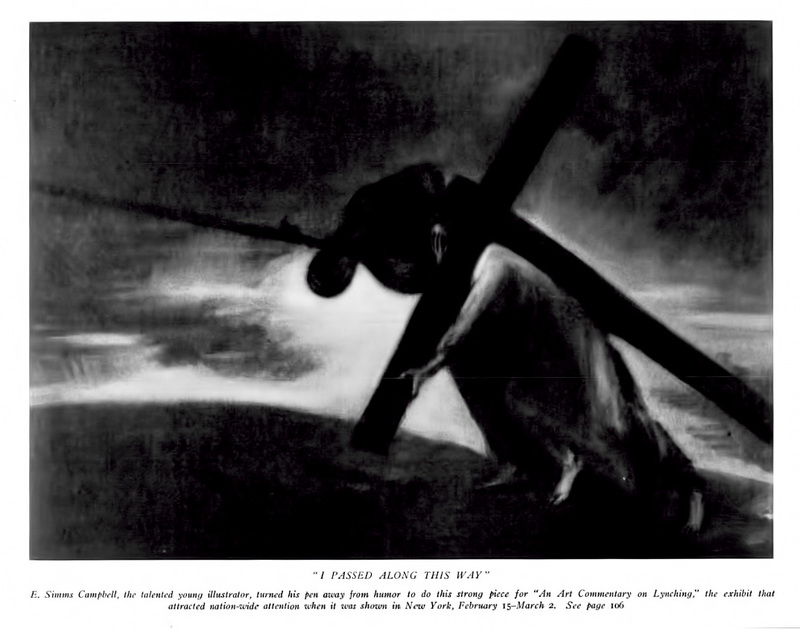 For example, the charcoal drawing I Passed Along This Way by E. Simms Campbell shows a Christ figure carrying a cross up a hill alongside a black man being pulled with a rope around his neck. The Crisis, a monthly magazine put out by the NAACP, consistently published anti-lynching art under the leadership of W. E. B. Du Bois, keeping the issue before the public’s attention. “Christmas in Georgia, A.D. 1916,” by Lorenzo Harris. Originally published in The Crisis, December 1916, pp. 78-79. In reflecting on the twin symbols of cross and lynching tree, Cone wrestles with the meaning of suffering, death, and resurrection—Christ’s, and our own. Is suffering redemptive in and of itself? Can the lynching tree reveal God? What is the spiritual power of the cross? How do we find victory in defeat? How does a life live on? He also tackles the question of identity. He doesn’t provide definitive answers to these questions; instead he relishes their mystery and points to how the answers have been embodied in the lived experience of African Americans. 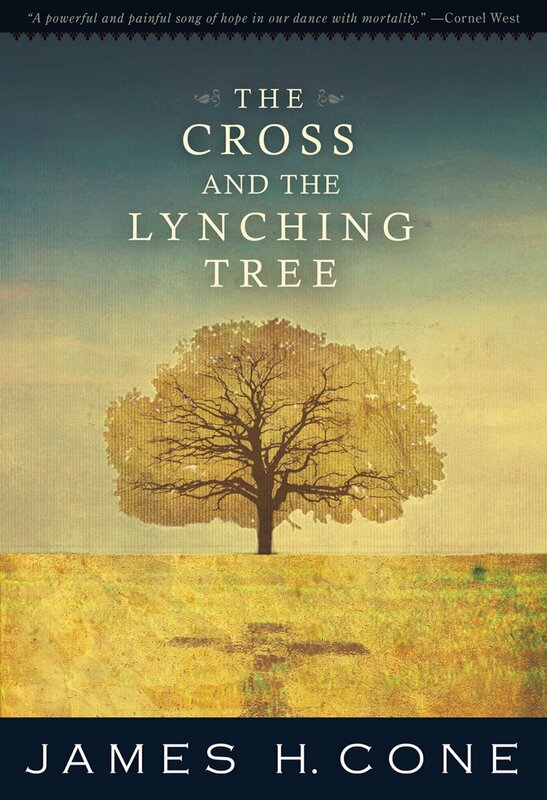 The Cross and the Lynching Tree was a series of revelations for me. Where history and theology textbooks fall short, this book delivers, and I am grateful for the education I received from it. I found the book informative, challenging, edifying, and inspirational. It invites a prayerful response, of confession, petition, and reformation. And it sparked in me a renewed interest in African American music and literature. Read an adapted excerpt from the book here. This entry was posted in Books, History, Politics and tagged black christ, christian racism, countee cullen, lynching era, lynching in art, lynching in poetry, white supremacy. Bookmark the permalink. Immensely informative review;I am impressed with the language that you have chosen to validate your points of view. I shall add this book to my reading list. Reblogged this on Super Hero in Training. Cone was my teacher back in the 1990s. Highly respect the man. He told this white Christian that I would probably never, EVER, “get” Jesus and be a real Christian, because my privilege, skin color and white habits would keep me from ever hearing the Christian gospel as it is meant to be heard. That is, I would/could always use my white-originated power to keep my distance from the hurting people of this world. Some days I think Cone is right; some days I think he’s wrong, but every day I give thanks for that conversation. It has been my daily companion for 30 years.